15th Annual Pilgrim Furniture & Mattress City Open Classic Golf Tournament by Southington-Cheshire Community YMCAs Inc. 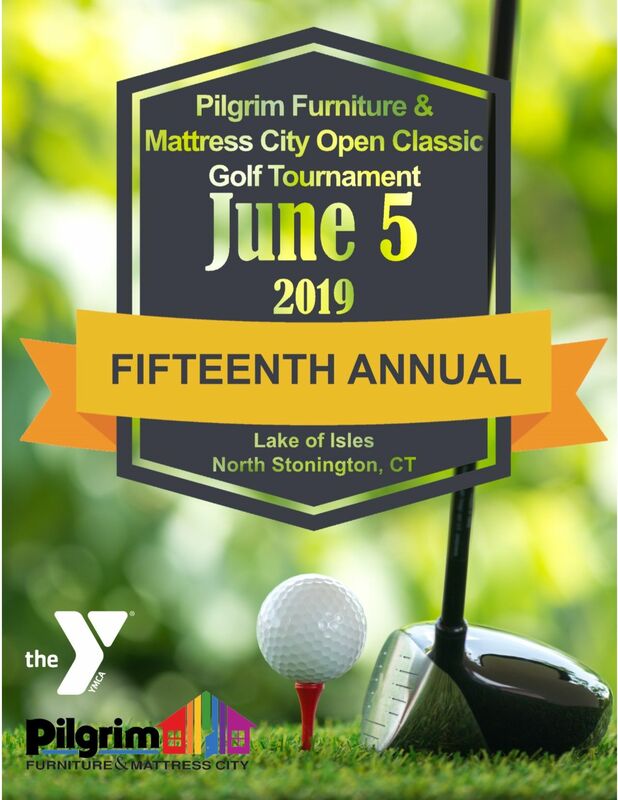 Wed, Jun 5th 2019 at 10:30 AM EDT · By Southington-Cheshire Community YMCAs Inc.
15th ANNUAL PILGRIM FURNITURE & MATTRESS CITY OPEN CLASSIC! Proceeds from this event benefit the Southington Community YMCA. Includes lunch, an 18-hole round of golf for four people, two golf carts, happy hour with two drink tickets/guest and dinner. Includes lunch, an 18-hole round of golf for three people, two golf carts, happy hour with two drink tickets/guest and dinner. Includes lunch, an 18-hole round of golf for two people, one golf cart, happy hour with two drink tickets/guest and dinner. Includes lunch, an 18-hole round of golf, golf cart, happy hour with two drink tickets and dinner. Three foursomes, company name in all news releases, acknowledgment in social media, company name/logo on course tee sign, name/logo acknowledgment on each place setting during dinner, name/logo featured on large screen during the event, recognition in PFMC’s newsletter and recognition at the Southington Community YMCA. Two complimentary foursomes, company name in all news releases, acknowledgment in social media, company name/logo on course tee sign, name/logo acknowledgment on each place setting during dinner, name/logo featured on large screen during the event, recognition in PFMC’s newsletter and recognition at the Southington Community YMCA. One complimentary foursome, company name in all news releases, acknowledgement in social media, company name/logo on course tee sign, name/logo acknowledgment on each place setting on dinner table, name/logo featured on large screen during the event, recognition in PFMC’s newsletter and recognition at the Southington Community YMCA. Company name/logo featured on the gift given to each golf participant, a tee sign and two tickets to attend dinner. *Exclusive sponsorship—first come/first served. 150 golfer’s gifts will be distributed. A complimentary twosome, company name in all news releases, acknowledgement in social media, company name/logo on course tee sign, name/logo acknowledgment on each place setting on dinner table, name/logo featured on large screen during the event, recognition in PFMC’s newsletter and recognition at the Southington Community YMCA. In recognition of this sponsorship, you will have signage on the two beverage carts during the golf tournament. A tee sign with your business name/logo will be placed on the golf course the day of the tournament. Southington-Cheshire Community YMCAs Inc. has partnered with Give Lively to securely process your online donation. This transaction will appear on your credit card statement as "Southington-Cheshire Community YMCAs Inc.". This transaction is subject to Give Lively's Terms and Privacy.